In Algerian cuisine sfriya are a category of round, football (oval shapped with tapered ends) or patty shaped croquettes, dumplings or rissoles that are steamed, boiled or deep or shallow fried. The word sfriya is derived from the Medieval Arabic Isfîriyâ. They can be based on a variety of starches such as potatoes, flour, bread or legumes. Potato or semolina flour based one are probably the most common (potato croquettes are also called maqouda, meaning "the pounded"). In sub-Saharan Algeria sfriyas are made with black eyed peas and are similar to West African akara. Take some red meat and pound as before. Put it in some water and add some sour dough dissolved with as much egg as the meat will take, and salt, pepper, saffron, cumin, and coriander seed, and knead it all together. Then put a pan with fresh oil on the fire, and when the oil has boiled, add a spoon of isfîriya and pour it in the frying pan carefully so that it forms thin cakes. Then make a sauce for it. Break however many eggs you like into a big plate and add some sourdough, dissolved with a commensurate number of eggs, and also pepper, coriander, saffron, cumin, and cinnamon. Beat it all together, then put it in a frying pan with oil over a moderate fire and make thin cakes out of it, as before. Pound some garbanzos, take out the skins and grind them into flour. And take some of the flour and put into a bowl with a bit of sourdough and some egg, and beat with spices until it's all mixed. Fry it as before in thin cakes, and make a sauce for them. The last one looks like a simple falafel to me. Chick pea or fava bean based rissoles are made in Algeria but they differ from Middle Eastern style falafels. Falafels are more of a restaurant item in Algeria and definitely considered Middle Eastern in origin. Ramadan is the month for fried foods! Especially fried sweets or savory pastries like these samsas. These are fried in just a little bit of oil and are quite light compared to most fried pastries or turnovers. They taste rather like a semolina pizza dough stuffed with spiced potatoes. I serve these with a spicy chermoula or a salsa tomatish. A mixed green salad or a sweet and peppery orange and arugala salad. A spicy chick pea or lentil soup is also quite nice with these samsas. According to The Oxford Companion to Food 10th and 13th century Arab cookbooks call these sanbusak derived from the Persian sanbosag. South Asian samosas, Afghani sambosas, Central Asian waraqi samsa or sambusai varaqi, and Turkish samsas all belong to the same family of turnovers. Samsa is an Ottoman influence in Algerian cooking, but that doesn't mean we didn't have stuffed turnovers before the Turks. We had Moorish pastillas (beestiya), Arab trid, and Berber kesrettes. And post Ottoman rule, Algerians added cocas from Catalan to our culinary lexicon. This is a sandwich I made for a middle eastern kebab sandwich. But we make the same in Algeria. It's ground beef seasoned with merguez spices and shaped onto a steel kebab skewer and grilled. The garnishes are very simple, just sliced tomatoes, sweet onion and greens. A good lashing of harissa mayonnaise is optional. This is my merguez spice blend. I add over a dozen spices to it. You can see how red it is, the characteristic color for merguez. If you like hot peppers you'll love this dish. I should have made more, my Korean in laws were practically fighting over them. My mother in law called me to wax poetic about these peppers. I used Jalapenos because that is what I can fnd in Los Angeles for a good price. If you are in an area where Algerian peppers are not available use your favorite small Mediterranean peppers. I will discuss the specific varieties used in Algeria in separate posts. My recipes are here to encourage you to make due with what you have, to think like an Algerian. Of course if you have the time and the money demand ingredients from your grocer, farmer or supermarket. It's amazing to read about Paula Wolfert struggling to find even cilantro in America when she was working on her Moroccan cookbook. The pool of olive oil is delicious. You can dip bread into it or reserve for a vinaigrette. This is a rich and flavorful dish. You can serve it as part of a meze/kemia or as a side dish or condiment. I decided to stuff some of the smaller vegetables from my Iftar mise en place Dolmas are an Ottoman introduction to Algerian cuisine. Before the Turks came the Badwi were stuffing meats and vegetables and there were Moorish stuffed dishes as well. So the concept of stuffing was not introduced by the Ottomans, rather a set of dishes and techniques were added to the layers of Algerian cuisine. Scoop out the center of the vegetables with a small spoon, be careful not to dig too deeply. You want to leave at least a 1/4" at the base. Chop up the scooped bits of vegetable to use in the stuffing. You can saute them for more flavor, remember to cool them before adding the meat. I know, I know most of my dishes contain meat. That's my own preference. I'm a big meat eater. There are stuffings made entirely from vegetables as well. I will post recipes for those later. This is only one version I have, there are many more to come. 500 grams of ground lamb or beef. Traditionally lamb is used. The fattier the better. Algerian savory pastries range in sizes and shapes from triangles, little logs, longer thinner fingers, slender cigars, half moon briks, crescent shaped cocas to humongous moon shaped pastillas. These are briks with a potato filling Brik b'il Batata. I also used the same filling to make little boureks, braewats or samsas. Traditionally pastillas are huge labor intensive concoctions. Scaling down the size of pastilla doesn't take a single bit away from it's flavor, but reduces preparation time and effort considerably. If pastilla sounds like bastila to you, that is because that's exactly what it is. As usual, Algerians have a variety of pastilla preparations. If the name sounds Spanish too, well that's because it is a Spanish name. There is an antecedent to this dish in the anonymous thirteenth century Hispano-Muslim Cookbook which describes chicken wrapped in many paper thin sheets of dough. I do have a copy of the anonymous cookbook, but I did not make the connection until I read about it in Clifford Wright's A Mediterranean Feast. My method for making pastilla is very easy. I know there exists a certain type of food lover and cook who wants to believe that protracted cooking methods result in better dishes. This is simply not always the case. There is absolutely no loss of flavor with my method. But if you want to try a side by side taste comparison with a more involved method wipe yourself out. In the old days it was labor and time consuming mostly because of the warka leaves and the sheer size. You needed a dada to come to your home to make it or purchase them through a warka maker, so this dish wasn't always accessible to poorer people. It was a dish for the wealthy or for feasts. I know I said earlier that I would post about Algerian flat breads and pasta dishes this weekend, Well this weekend was more hectic than expected. And my poor quality digital camera refused to function properly most of the time. 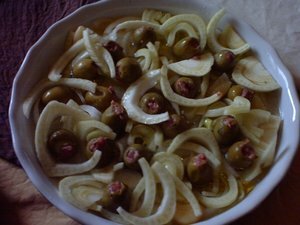 I was thinking about leavened and unleavened flat breads that we top with different vegetables in Algeria and I thought of this dish that is usually eaten as a meze or kemia. It is also used as a topping for flat bread, a kind of "pizza" that we usually call Khobz bel plus whatever topping. Traditionally the meat for keftas was cut into little pieces and pounded. If you have the time I suggest you try this method for keftas, the texture is superior. The host for the 18th edition of IMBB Is my blog burning? is At Our Table. The current edition's theme is "Summer's Flying, Let's Get frying!" My contribution is Brik b'il Tunn. The recipe is easy, but it's necessary to work very quickly. Warka leaves are very delicate, as are spring roll wrappers if you choose to substitute. Once the tuna mixture and egg are placed in the wrapper it must be fried immediately. It cannot be left to sit for any period of time. These briks are addictively delicious. I can eat three to four, most people eat one. They make a nice light lunch with a salad or can be served as an appetizer.